Last Chance for your Extra Discount! HURRY ON IN -- there are only three more days for mailing list members to get your extra 20% discount on all our full and sale-priced fabrics. That means potential discounts of up to 70% off our regular prices! Not on our mailing list? Sign up today for the extra discount! Our winter clearance sale will continue through Sunday, January 5, 2014. Don't forget that Treadle will close at 5:30 p.m. on New Year's Eve and re-open on Friday, January 3, 2014. The store will be closed all day on Thursday, January 2, for inventory. Our Annual Winter Clearance SALE starts today, Dec. 26th. Stop by now through the end of the year to enjoy discounts from 20% to 50%! Mailing list members receive an additional 20% off! 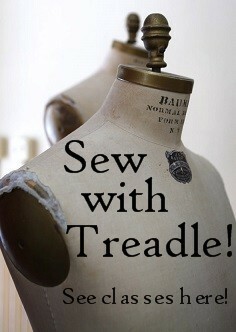 Come and find something special to sew at Treadle! As Bob Dylan wrote, “for the times they are a changin’.” This has been a challenging year at Treadle. Following a banner year in 2012, sales this year have been very soft and we find ourselves struggling to survive. My Parkinson’s Disease has progressed and I find I must make some concessions in order to lighten my work load and stress level. I have been seeking a buyer for Treadle for over 9 months. While several individuals have expressed interest and explored the possibility of a purchase, as of this writing, no one has been able to put together a viable proposal. Barring a sale, Treadle will close sometime in the first half of 2014. I would love to see Treadle continue to serve the incredibly talented and wonderful sewing enthusiasts we have come to know and love. My heart and soul have gone into this place and I have come to know so many caring, warm, funny and compassionate women and men, and feel so blessed to be able to call you my friends. My fabulous band of hard working, creative co-workers is ready to carry on under new ownership and I have pledged to stay on as long as needed during the transition. Be on the lookout for news of a potential crowd funding campaign and changes to our hours of operation. Please know how grateful we are for your support. We are working very hard to find a way to allow Treadle to continue. Squishy soft and richly textured, boiled wool is a treat to sew and wear. Usually made from wool knit, these boiled wools have been slightly felted to create a delicious dense texture that keeps edges from raveling and keeps the cold winds at bay. Perfect for jackets, coats, and capes, and available in a rainbow of colors. Stop by and take a look! Still looking for the perfect last-minute gift? How about a pair of easy, cozy pajama pants? Our selection of cotton flannel patterns range from plaids and florals to whimsical brights. There's something perfect for everyone on your list! We have a selection of dreamy cotton chenille at Treadle right now. These soft, thick fabrics have the pile running in stripes or swirl patterns, in solid bright or pastel colors. Chenille has a sweetly vintage feel that is perfect for a classic, cozy robe. Or use it to back a soft flannel blanket or throw. Tweed, in twill, houndstooth, or heathered plain weaves, is a superb choice for winter outerwear. Classic coats, jackets, and vests will shine when made in a luxurious wool tweed. Multiple shades of color in the weave allow tweed to blend with many coordinating colors, making it a versatile wardrobe staple. There's so much more in our store! Come take a look! We have a new selection from everyone's favorite Japanese fabric lines, Echino and Kokka. Kokka is a lot more whimsical, featuring cute animals and letters. Ideal for pajamas or quilts for kids - or kids-at-heart! New at Treadle, by popular demand, we have a selection of polar fleece! This superb quality Malden Mills Polartec is double-sided, so it's plush and soft however you turn it. It's available in a rainbow of saturated colors - you'll find one just right for a blanket, vest, or coat to keep out the cold! It has great stretch and doesn't ravel, so it's a perfect choice for easy projects that keep the finish work to a minimum. Come into Treadle today and find something to help you stay cozy!